The year started in dramatic fashion when Celtic came to visit Fir Park.This was only a few months after they had lost the league to Scott McDonald's late goals and it was another classic.We were 3-1 down at half time but headed goals from Hamilton, McDonald and Kinniburgh looked to be giving us an astonishing victory.However, in an early sign of what was to haunt our season we lost a soft, late equaliser.Two points dropped or one gained?It was hard to tell.This game also saw the debut of on-loan Alan McCormack but it turned out to be the last for Gordon Marshall.He turned in a suspect performance before injury and the form of Graeme Smith kept him out the side until he moved to Hibs to become their goalkeeping coach. 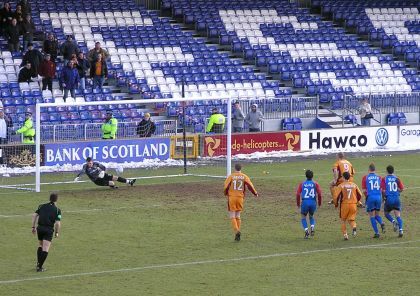 Jim Hamilton's last minute winner against the ten men of Dunfermline kept us ticking over nicely before the Rubgy Park curse struck yet again and we were horsed 4-1.A remarkable game followed against Dundee United at Fir Park when we threw away 2-0, 3-1 and 4-2 lead to eventually lose 5-4.It was apparent at the time that we could ill afford to drop points like this and so it would eventually prove.We were dealt a Lanarkshire derby in the second round of the League Cup and a makeshift team scraped home thanks to another late goal from Jim Hamilton.Would this be the start of another run to Hampden? The league dealt us two tough fixtures after the United debacle.A breathtaking Gordon save in the last minute at Tynecastle denied us a point but we came from behind to win 2-1 at Inverness.A 5-0 thrashing of Falkirk at Fir Park more than steadied our ship and as a result, after seven games we had a respectable 10 points and sixth place.We squeeked past St Mirren in extra time in the League Cup to set up a quarter final meeting with Aberdeen before Hibs destroyed us with some fast attacking football we just could not live with.We chucked away more points, this time at Aberdeen, contriving to draw after being 2-0 up against ten men with ten minutes to go.A nervous win over a diabolical Livingston side gave us a boost and a routine defeat at Ibrox completed the first third of our pre-split fixtures.We were in the top half – just – but there was already a mounting feeling of what might have been.Had we defeated United and Aberdeen, as surely we should have done, we would have been comfortably in fifth place only a point behind Rangers in fourth. 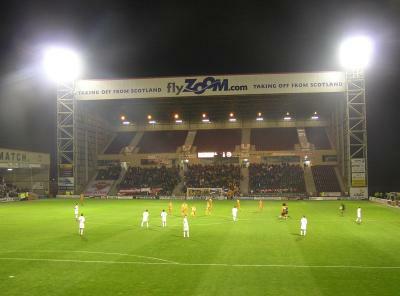 Instead we were looking anxiously behind us at Aberdeen and Inverness.